Kelli Allen’s work has appeared in numerous journals and anthologies in the US and internationally. She is a four-time Pushcart Prize nominee and has won awards for her poetry, prose, and scholarly work. She served as Managing Editor of Natural Bridge and holds an MFA from the University of Missouri St. Louis. She currently teaches in the MFA program for Lindenwood University. Her full-length poetry collection, Otherwise, Soft White Ash, arrived from John Gosslee Books in 2012. Why does being human seem to require a stubborn preference to remain unaware of ourselves? Allen knows we’d rather not be illuminated, that the shadows are more comfortable because the low light is more forgiving. If we stay in the shadows, we don’t have to “see a wing, feel/ a ripped feather.” A very old idea, indeed, but with a twist this time: the poem’s own self-awareness. Overlaid on the light and shadow is the speaker’s frustration with cliché. She’s a writer, for sure, and not happy about having to use an overworked set of words. But they are the right words, the best words to express this idea. And so the speaker’s grudging lexicon is a reflection of the force exerted by the “bloated” sun to make her really see. A poem about light should cast a shadow. Not toward the right – that would be too similar to traditional italic. 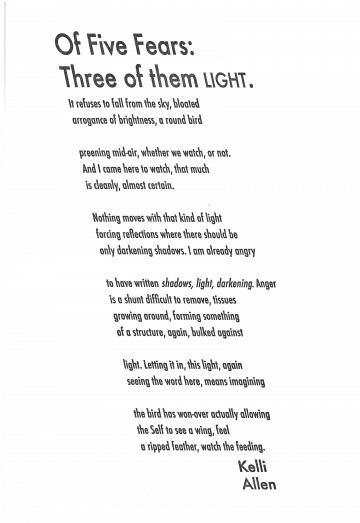 Toward the left, then, the whole poem pulling against its italicized fears: “shadows, light, darkening.” To take the shear and remain legible, the typeface needed to be sans serif and have evenly weighted strokes. Futura’s solid, unfussy letterforms hang together in a cool, dark swath.